Valentine’s Day 2006 was shaping up to be more like Single’s Awareness Day. Having gotten out of a relationship that spanned the two Valentine’s Days previous, I found myself in my room at Clark Kerr, alone, a tea candle or two lit, drinking some tea and listening to Nick Drake. But then a rapping on the door! I drag myself out from under my duvet and open it to reveal my resident L. and her friend A. This girl, A., was in the latter category. Pretty face, big dark eyes framed with dark lashes, supple red mouth, all framed by “long dim hair” (a point for anyone who can identify that literary allusion). I was drawn to her lips, her eyes, her hips… her hips were womanly, curved and full of life. The night developed well. For some reason I was feeling especially bold–I looked at her and into those eyes. She blushed, looked down, but always looked back up to meet my gaze. I don’t remember why I had this on hand. I think I had had it before and figured it was good to have–one of the few cases of my exhibiting some foresight! 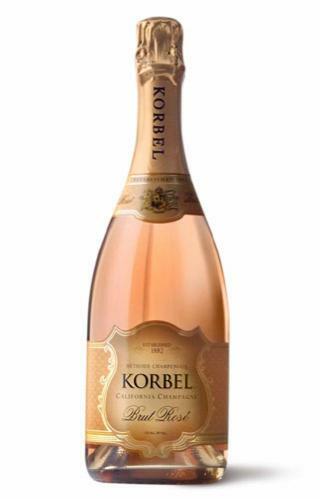 The Korbel brut rosé (pinot noir and chenin blanc) is very fresh and drinks relatively well, though it is not something I would want more than a glass of. It’s brut so it’s not noticeably sweet–there’s a bit of strawberry in it, and of course it’s pink, which gives the impression of sweetness. I can’t say it’s my favorite sparkler (Veuve Clicquot would take that distinction) but it’s definitely a huge step up from Cook’s, and an affordable college luxury. And, when combined with vodka, Jack Daniels, candles, music, and Valentine’s Day, it’s pretty darn great! I agree that romance and booze go hand in hand. You should write a blog about your romantic adventures, I’d read that on my “off time”.